The text below is the latest Kanzius News brought to us by an email from Mr. Mark Mark A. Neidig, Sr. who is the Executive Director of the Kanzius Cancer Research Foundation. In our efforts to keep you up to date on the latest news from the Kanzius Foundation we have re-published the email below, with minor editing. Yesterday, was certainly one of the most exciting days I've had while leading the Kanzius Foundation. I had the opportunity to take a generous couple to the Kanzius/Curley Labs at M.D. Anderson Cancer Center (MDACC) and "show it off!" As a parent, I love to brag about my kids but, in this scenario, I was able to show our "secret donors," the ones who gave $250,000 following the Pepsi Refresh Everything contest, the research in action. What a great honor to introduce them to Dr. Steven Curley and his staff. To see the GenV's in operation. To say thank you! To get to MDACC, we had to walk right by the Texas Children's Hospital; an impressive campus with animated signage and prestigious buildings. But that isn't what I remember most. We saw the children. Many without hair. Many in wheelchairs. Many who were so frail that they slumped over, grasping their parents' hand with every ounce of strength that they had. I couldn't help but think about John Kanzius and how the commencement of "the world's most promising cancer treatment" began with the images of the children just like these. It is such a moving sight. And even more impacting, John knew exactly how they were feeling. And that's why he was determined to find "a better way" to treat cancer. We met several of Dr. Curley's staff in the lab. Each shared the responsibilities they have day in and day out. It's a very large international team: Mexico, China, England, Thailand, India, Scotland, Pakistan, Japan, Korea and Russia...oh, and yes, the United States! Dr. Nadya Koshkina (right), who has a PhD with expertise in molecular biology. She is working on a novel way to treat lung metastases using the Kanzius Noninvasive Radio-wave Cancer Treatment. As we chatted she shared "I love the idea that I will develop a treatment that is both effective and noninvasive!" She is using an aerosol technique to deliver the nano-particles to the lung metastases. Her background at Rice University was in pediatric cancer and that availed her the opportunity to introduce Osteosarcoma to the Kanzius Labs' repertoire. 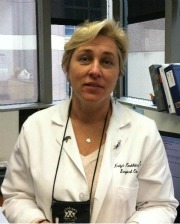 This is the first pediatric cancer being studied under Dr. Curley; a children's bone cancer that is nearly untreatable. Now, more than ever before, we are true to John's dream. For all of you PinkWell Challenge followers and more specifically those interested in our breast cancer research, the Kanzius/Curley team is now partnering with a team of researchers from Methodist Cancer Center in Houston to attack the difficult-to-treat and extremely aggressive, triple negative breast cancer. Breast cancer is not one form of cancer, but takes on the form of many different "subtypes" of cancer. These subtypes are generally diagnosed based upon the presence, or lack of, three "receptors" known to fuel most breast cancers: estrogen receptors, progesterone receptors and human epidermal growth factor receptor 2 (HER2). Utilizing the breast cancer expertise of the Methodist team and the targeted nano-particles and radio-wave technology of the Kanzius/Curley researchers, validation a non-invasive and effective treatment for triple negative breast cancer is on the horizon. Much of the work done in the "scientific" part of the laboratory takes months and months of tedious observation and validation before it ever reaches the Kanzius RF (radio frequency generating) Device. With three GenV's, the fifth generation of the RF machine, in operation progress is ramping up for the final validations before a formal presentation to the FDA. The questions that need answered: Does the new machine work consistently, accurately and safely and do the pancreatic and liver tumors in larger subjects respond positively to the treatment? A new, large non-human subject model is being developed by combining all of the findings from the past years of testing. Only when the GenV and larger subjects are validated and peer-reviewed by industry experts can the Kanzius Noninvasive Radiowave Cancer Treatment be approved for human trials. All the while, research on colon cancer, leukemia, melanoma and prostate cancer continue. As does advanced modeling of nanoparticles and the "magical" antibodies that direct the small metal particles to the cancer cell. Two additional peer-reviewed manuscripts were approved for publication while I was with Dr. Curley. As you can imagine, there was a lot of celebration in Houston! Dr. Curley's expertise and passion, the machines, the manuscripts, the addition of pediatric studies, the dynamic team...and yet, the urgent need to move ahead aggressively perplexes me. So much has been accomplished because of your past generosity. But the progress can only continue if you give again and again. The Kanzius Cancer Research Foundation does not have millions of dollars in reserve. I wish we did because we could write a $1.2 million check to M. D. Anderson this afternoon. Since we don't, please give today. For today and for future generations, let's prove there is "a better way!"